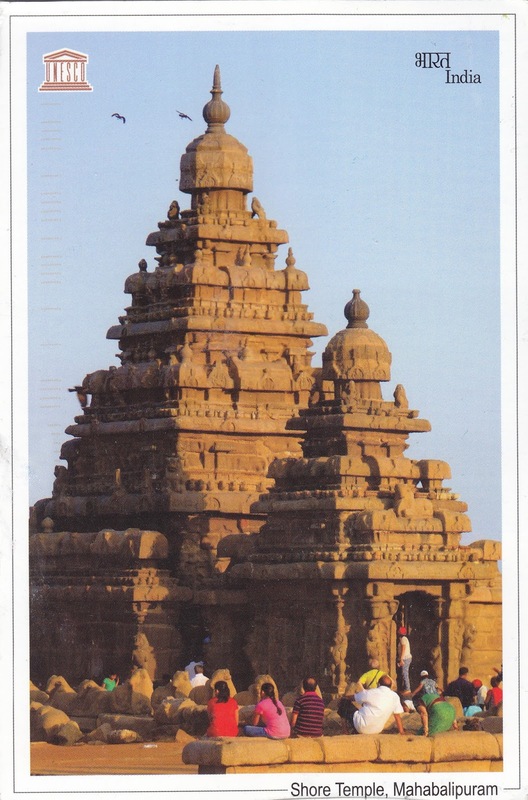 Postcard IN-177804 from India shows the Shore Temple, built with blocks of granite in 700–728 CE, overlooking the shore of the Bay of Bengal at Mahabalipuram in India. It is one of the oldest structural stone temples of South India. Mahabalipuram was once a busy port during the reign of Narasimhavarman II of the Pallava dynasty. As one of the Group of Monuments at Mahabalipuram, the Shore Temple was recognized as part of a UNESCO World Heritage Site in 1984.